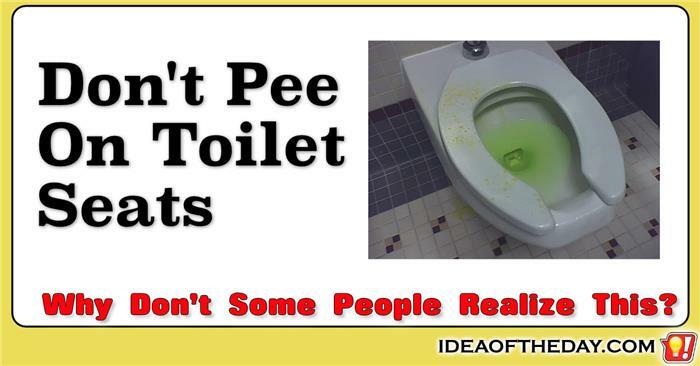 Don't PEE on Toilet Seats! Some people are disgusting PIGS! One of the most disgusting things about public restrooms is walking into a stall and finding that the entire toilet seat is covered with PEE. Why on earth is this so common? I used to think it was mainly from young kids who aren't mature enough to manage their bathroom routines, but I often see this in office buildings, where the only people using them are so-called "adults". Can you imagine that? These are professional office workers who don't have the common sense to simply lift up the toilet seat before they pee. Why... Why... WHY? 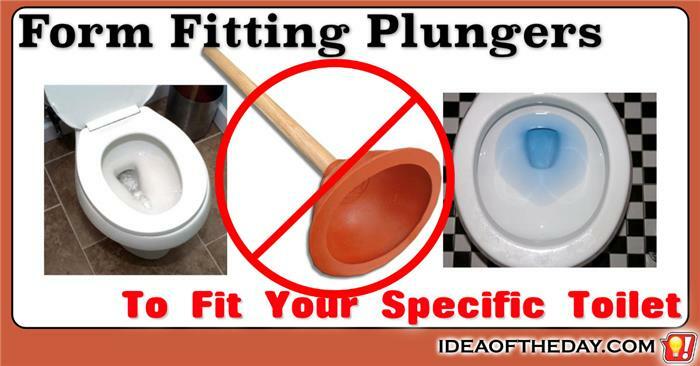 Public bathrooms STINK... but there's an easy solution! We all know people can be disgusting pigs, but they're only PART of the problem. The real problem is that people have no way to clean up after themselves. The solution is as simple as giving bathroom patrons access to cleaning products. I'm not suggesting that patrons are going to spend an hour cleaning a filthy bathroom, but the bottom line is that SOME of them will take the time to clean up after themselves when they make a mess, as long as they have the tools to do so. Without placing cleaning products in the bathroom, there's a zero percent chance they will do it. Don't you hate when a public bathroom doesn't give you a place to hang your coat? It drives me crazy when I go into a public restroom and I don't see a hook anywhere in the stall. Where do they expect us to put our coats? Either the management never noticed it, because they keep their coats in their offices... or the more likely reason, they simply don't care about their customers. Without a hook, we are forced to either try to hold our coat while we take care of business, or figure out a way to flop it over the door. It's not easy, especially in the winter, when people have heavier coats. What bugs me most about this problem is that there's such a simple, and inexpensive solution. All they need to do is mount a simple hook somewhere in the stall. Bathroom Blowers are NOT as Good as Paper Towels! Don't you hate going into a public restroom and they don't have a paper towel dispenser? I don't know about you, but I simply don't like using electric blowers to dry my hands. Although you can debate whether they are better for the environment, there's no debate about how effective they are. Simply stated, paper towels do a better job of their primary purpose... drying your hands. I hate when a Men's Room doesn't have dividers between the urinals. I get it. Men's room urinals are meant to be more efficient. They're faster, use less water, and take up less space than a regular stall, but that doesn't mean they need to be on top of eachother. There should always be at least a small divider between each urinal. It's not hard to install, and it doesn't take up more than an inch of wall space. Dividers not only give you a bit more privacy, but they protect you from any disgusting piss spraying from the guy next to you... especially from "The Shake". It's not rocket science, so why do some idiots still do it? For what it's worth, there's no reason for me to post this "Idea". It should be self-explanatory. Nobody likes to sit on a toilet seat full of piss, but somehow there are still people out there that just don't get it. We see it all the time. We walk into a public restroom, enter the stall and there it is, a disgusting mess. For the life of me I can't imagine the kind of jerk that would leave a mess like that behind. You'd think that anyone with half a brain would figure out that if you simply lift the seat up with your foot before you pee, you'd have a nice big target... and show courtesy to the next visitor. 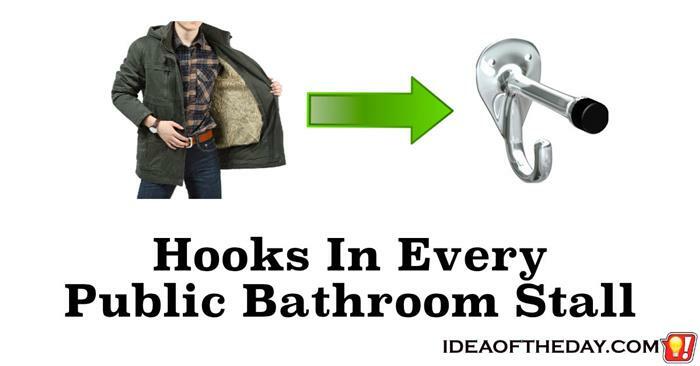 I hate when I go into a public bathroom, and they don't have a hook on the back of the door for my coat. Doesn't this drive you nuts too? To me, this seems like something obvious, but somehow I've seen that a large percentage of public bathroom stalls don't have hooks on the back of the door. Where do they expect us to put our coat when we're using the toilet? Unless you've got a friend outside who can hold your coat, the best you can do is try slinging half of it over the top... and that's just plain stupid. I can't think of one good reason for a Men's Room to have urinals without partitions, yet I see it all the time. All I can think of is that the people who installed the urinals are trying to save a few dollars, because there simply is no other justification for not having them. 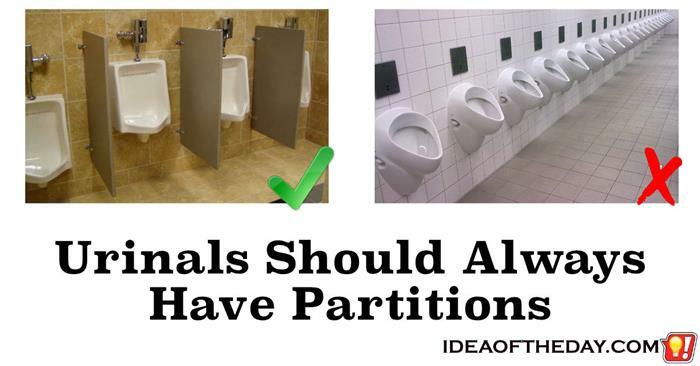 Partitions are simply a small wall between urinals, so they don't take any additional space. Since there's still no door, they don't get in the way or slow you down. The bottom line is there is no reason to leave them out. Here are a few simple reasons why every Men's Room should have them. 1. Privacy. This one is fairly obvious. When I'm washing my hands, I don't want to get a front row seat to men holding their junk. 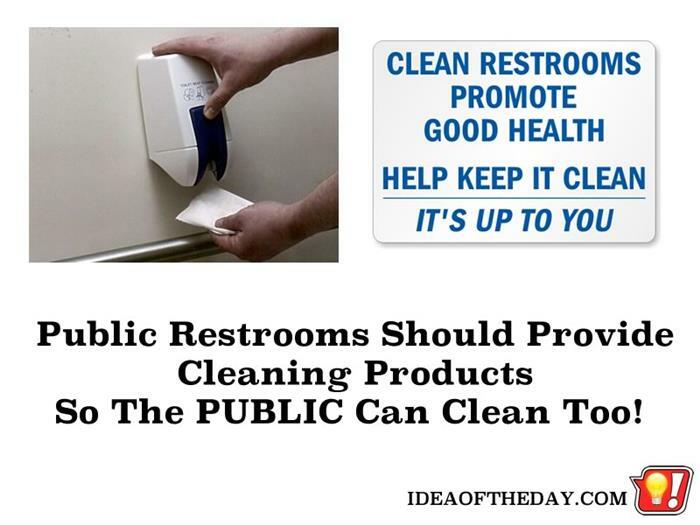 Why Don't Public Restrooms Provide Cleaning Products? We've all faced that moment where we walk into a restroom, and seconds later, we walk out without using it, even though we really needed it. Yes. I'm venting again. I'm not complaining about how dirty public bathrooms are. We all know some that are good, and some that are pretty bad. What I'm venting about is that people are complaining, when there is a simple solution. Provide some bathroom cleaning products to the public a and let people clean up when needed. People fall into two camps. They either blame the last person to use it, or they blame the management. The way I see it, it doesn't matter. If companies at least provided cleaning products, there's no doubt that the restrooms would be cleaner. Kryptonyte is Superman's weakness. Mine is leaking toilets. I hate waste, especially when it comes with a price. Back in the days when water was relatively cheap, a leaking toilet was just an annoyance. Today, a leaking toilet is literally throwing a lot of money down the drain. It's bad enough my typical water bill is about $100 per month... Paying nearly twice that because of a leaking toilet drove me to think of ways to insure that never happens again. 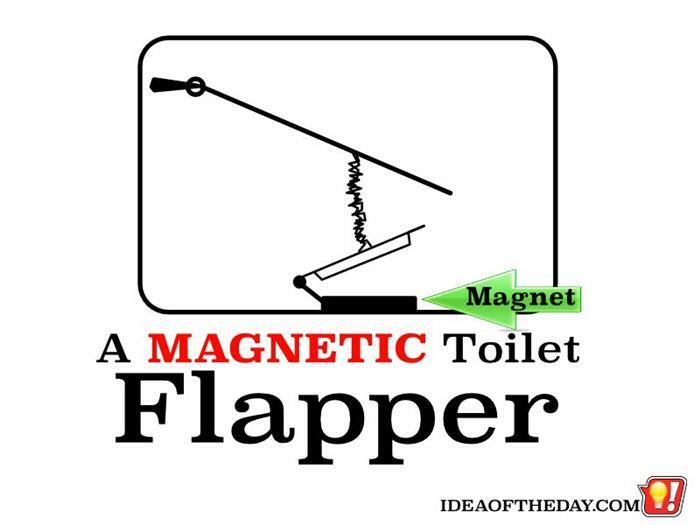 That's how I cam up with the idea for a magnetic toilet flapper.